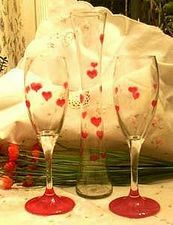 Set the mood on Valentine’s Day with hand-painted champagne flutes featuring a heart motif. Or celebrate St. Patrick’s Day with shamrock wine glasses. For Mother’s Day, or other special occasions, just change the theme – but keep the shapes small and simple for the best effect. 1. Wash glasses thoroughly with soap and water and allow to dry completely. 2. Paint design on glasses. You may use stencils, or place a picture that you like on the inside of the glass, applying your colors on the outside to match the photo. Simple handdrawn graphics like hearts, shamrocks or daisies also work well. Free hand designs will give your work an artsy, hand made look. 3. Remember, with glass, “less is more” and less busy designs often provide the best effect. If you make a mistake, dip a q-tip in rubbing alcohol and gently wipe away anything outside of the design (be aware, however, that if the rubbing alcohol runs into your design, the paint may run or smudge). Be creative, be artistic…if you truly dislike the result, just wash in warm water, or wipe completely with rubbing alcohol until the paint is gone — and try again! 4. Wait 24 hours to allow paint to set and cure, before baking to set the design permanently. Follow package instructions for baking — the glasses shown were baked in the oven for 40 minutes at 325°. After baking, your design should be resistant to normal usage and dishwashing.